One size fits them all! Remember when, as a child, you used to play for hours with a cape made from a pillowcase? Or maybe it was your dad’s favourite shirt? Well, some things don’t change. 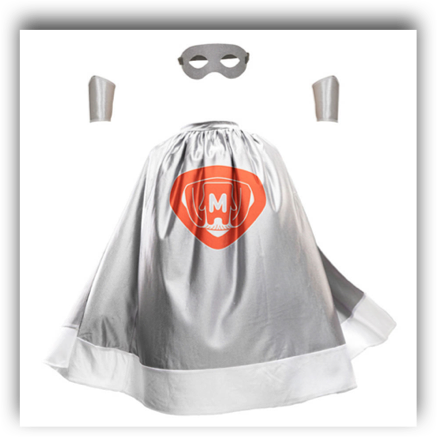 Hours of imaginative role-play are guaranteed with the super stylish silver Swoopercape, a must for every superhero in-the-making! Here your child can make it their own by choosing an emblem, colouring it in and even add their own initial in the middle! Complete with matching mask and sonic wristbands, adjustable with Velcro, your child’s secret identity is good to go. Flex print shiny/ smooth surface extremely durable.